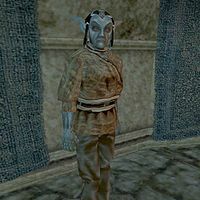 Galtis Guvron is a Dunmer pawnbroker who can be found at The Rat in the Pot in Ald'ruhn. He doesn't have much in the way of wares, but what he does sell tells a lot about him - he apparently has ties to the Sixth House, and has been tasked with placing ash statues around the city. The note you'll find on him explains it all. "I don't know what you're talking about. I don't know anything about any statues." latest rumors: "Did you hear that high ranking Legion officers duel each other for rank?" This page was last modified on 14 July 2018, at 19:28.